We really like the look of fire and water combined. Well, we are not saying that you put a fire and the kill it with water. No, we are referring to pool areas with a fireplace or a fire pit. It’s like a balance of both elements are seen once these are featured in the pool area. 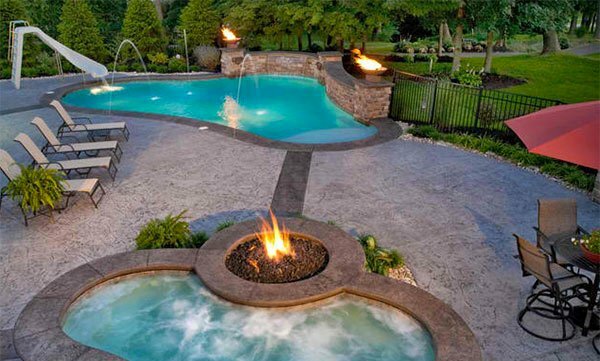 And yes, even a traditional pool could have a fire pit. As a matter of fact, they look even more gorgeous with stones and pavers on the deck. So, we have gathered some traditional pools that have fire pits. We enjoyed looking for these items and we were surprised that traditional pools are also as stunning as the modern and contemporary ones. So you will understand what we mean, take a look at the list below. The color pebble tec of this pool area is Lucayan Blue River Rok. 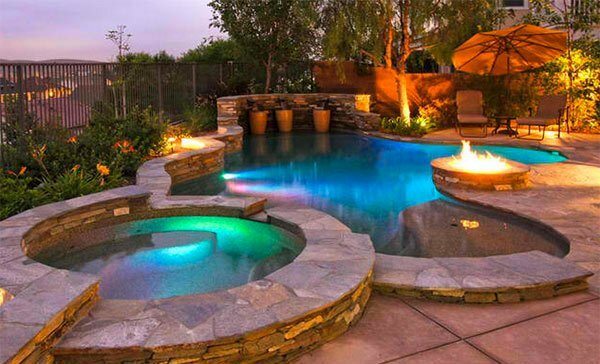 The fire pit in the middle of the pool is very stunning! “The fire pit is made of chopped Granbury stone on the outside to match the stone of the house and the top is Oklahoma silvermist flagstone to match the patio. The interior is fire brick with fireglass,” said the designer. According to the designer, this is an oversized custom fire pit with an inside dimension of 48″, height of 18″ above finished grade and a cap width of 18″. What a beautiful pool area! That fire pit adds a lot of drama to the space which has an arc bench around it. That hill of plants makes this pool area a paradise! 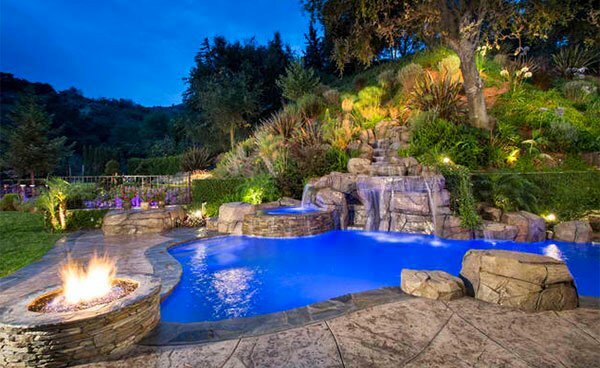 We just love the lights, the waterfall, the fire pit as well as the shape of this pool! What a glowing evening! 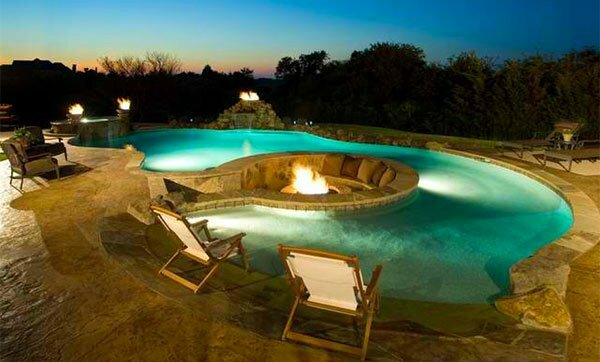 The lights and the fire work well together for this pool area. Well, we think we can smell barbecue too for this is a perfect spot for an outdoor party! This pool features a sunken island reached by stepping stones. When night time strikes, it looks even more lovely with the fire pit at the center and its Palm Springs surroundings. Wow. 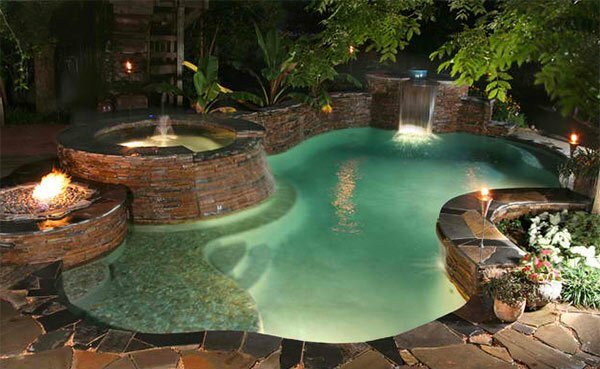 This traditional pool could give a different level of relaxation! The pool is raised with a fountain while a fire box is added to complement with the fireplace above. Cast was poured in place concrete coping that was embossed using multiple colors of light and dark grays-the result is gorgeous! 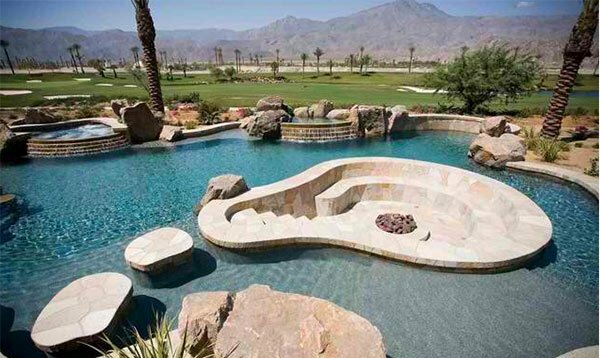 We like how two irregularly shaped pools where seemingly connected to each other. This also features a good combination of fire and water. 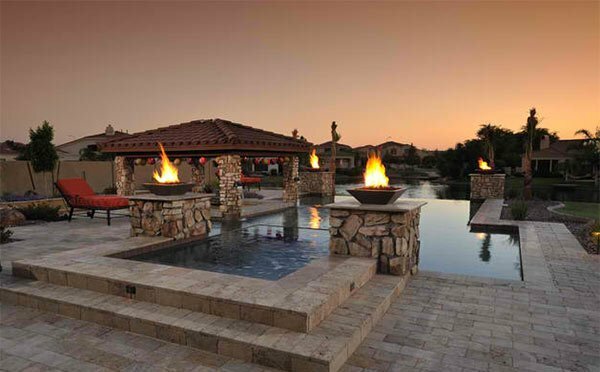 Fire effects and landscape lighting provide dramatic flair to this pool with natural travertine paver deck for evening entertainment. The water fall, spa, lighting, decking and fire feature- what more would you ask for a traditional pool? The natural stone product pre-made into interlocking panels that cladded the fountain and fire pan is very beautiful! It actually created a personality and statement for the pool area. 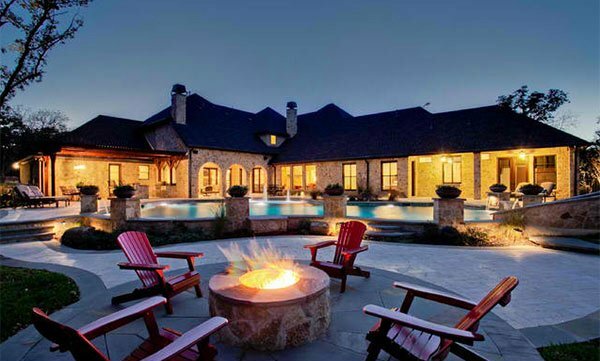 The fire pit overlooks the pool for this area which is a great idea too! 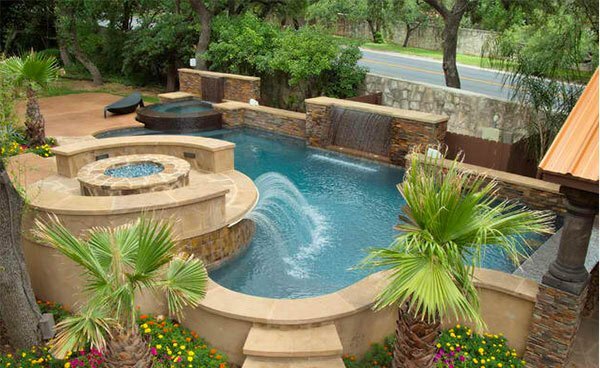 A jaw-dropping backyard traditional pool that you’ll ever wanted! It has fire pits, a fireplace, a waterfall and even a slide! 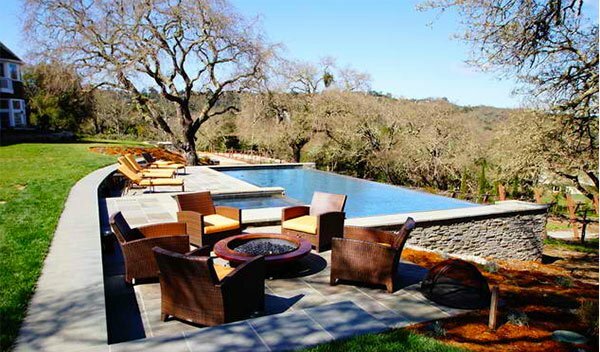 A traditional pool in San Francisco is this dashing with an infinity pool and a fire pit. 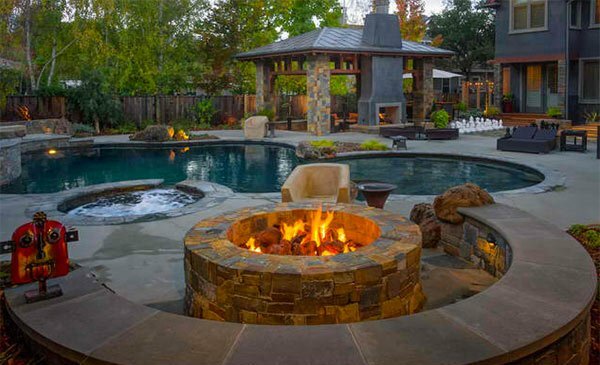 Now you know what we mean that these traditional pools with fire pits are really lovely! Most of them have irregular shapes which made them appear flowing and soft unlike the modern ones which are mostly edgy. 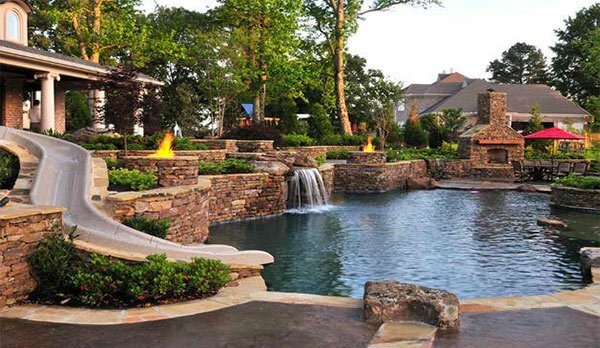 Well, if you love modern pools more because of their sleek look, you can get a glimpse of them from dramatic modern pool areas with fire pits. 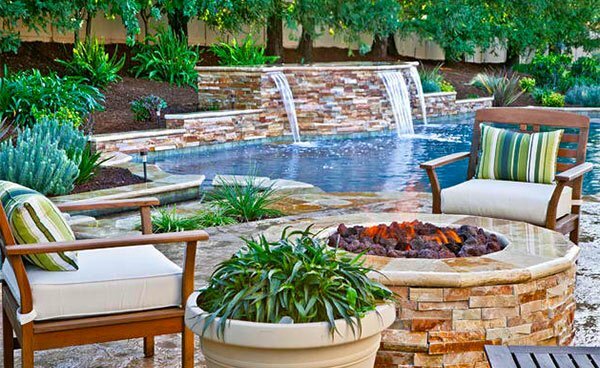 You’ll get a streamlined look not just for the pool but even the fire pit as well.